There are certain rituals that I have grown up with and I would love to pass those on to my children. For as long as I can remember, ‘lighting the lamp’ has always been one daily ritual. I don’t even think about it much. My grandmother did it .My mom did it—and now I do it too. A British friend of ours, was fascinated by the hanging lamp (yes, it is suspended from a hook and it hangs) in my house that I light, everyday. We would be having a conversation and at 6:30 p.m, I would excuse myself to ‘light the lamp’ and ‘say my prayers’. He expressed a desire to see it. He was very moved by it. He said there was so much positive energy and it calmed him, just looking at the incense and the lamp. I could almost feel his awe. As a child I did not realize how much significance it has. Now I do—and I hope that my children realize it, someday. It is indeed wonderful to be in touch with your traditions—be it religious or cultural. Lovely ritual, ps; reminds me of the votive candle that my mother used to light. I didn't read the article... I prefer my rituals minimally explained. I have one of my own - an unarticulated call of the heart that I will post about. Thanks for the inspiration. you are right. Soem traditions we do just coz we are in tune with them, but only after knowing the meaning behind the act, it feels all the more deserving and respectful. Religious, cultural or even familar, going from generation to generation. Beautiful ritual, makes the world of good to have something like that which is symbolic and calming at the same time. 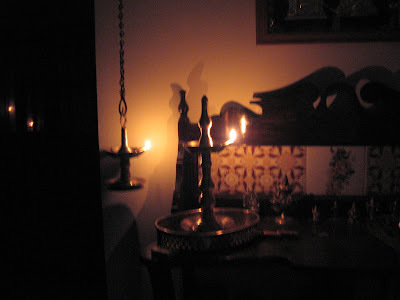 I used to light the lamp out of a religious belief built in me by my parents and folks around you. However the article is indeed very enlightening and true in so many ways. Light does indeed extinguish the darkness and ignorance from your lives. Also it is the one time when you pray and thank the good lord for all the wonderful things we have received. It instils faith and also helps become stronger. I guess when you pray with concentration you are also doing a kind of meditation which would help releive the stress built up. But overall fantastic and educating even to me as an Indian. Dat was wonderful.i was always one of those kids who put 'Whys' for everything....and today, i got all my answers.Thanks. We often light candles when we sit to eat as a family..it provides a focus to our thoughts and the light sheds a cozy warm glow on our faces making meal times special. we often hear about the fragmentation of famly life..the mealtime together is something we need to encourage as we share our thoughts and feelings. We also burn insence very often! Joe: The article explains the significanc-and it is so deep.And an amazing concept. Devil Mood:Yes, it is indeed. Niall: Incense does create a lot of postive vibes--dont you think? And I totally (again as always :) - we will soon have to find things to differ on.. we can't seem to have any debates amongst us) agree and hope that our kids also realize the value of these traditions and rituals (And we as parents will have a big role to play to make them see the logic) .. I was raised in a house that didn’t put a lot of focus on religion. There are times I wish I could have grown up a little differently. It’s wonderful that you are passing on your traditions to your children. I was raised by an alcoholic step-father and a mother who claimed to be an aetheist, yet she really liked 'that Jesus fellow'. My point: I never had any spiritual/religious traditions growing up. But, I always sensed a spiritual presence with me at all times and it felt good... it felt like true belonging and love. So, when I was just a kid, I created my own tradition of speaking to that presence; sharing my thoughts and feelings and dreams for the future. It may sound strange to some, but that presence always responded; not in audible words, but clear none-the-less. After a time, I incorporated the lighting of a candle into this tradition, because it just felt right. You know, light begets light; and what light is more natural than a flickering flame. I remember this very vividly from high school, there was this competition in school about science talk, and I was supposed to talk about light, I had this huge speech prepared with all charts, you know the usual stuff that happens at school. On the day I found out one of my good friends has chosen that topic as well. I finished a long speech with various theories about light etc and was very happy with what I had done, but then my friend started his speech, he started with "most of us begin the day, with lighting a lamp"..and I was floored..he spoke in so simple words that I knew he deserved to win..
Wedge heels saves the day! Smile --Tomorrow may be worse!